A little conner of the internet were books are read and reviewed. James Weldon Johnson's emotionally gripping novel is a landmark in black literary history and, more than eighty years after its original anonymous publication, a classic of American fiction. The first fictional memoir ever written by a black, The Autobiography of an Ex-Coloured Man influenced a generation of writers during the Harlem Renaissance and served as eloquent inspiration for Zora Neale Hurston, Ralph Ellison, and Richard Wright. In the 1920s and since, it has also given white readers a startling new perspective on their own culture, revealing to many the double standard of racial identity imposed on black Americans. Narrated by a mulatto man whose light skin allows him to "pass" for white, the novel describes a pilgrimage through America's color lines at the turn of the century--from a black college in Jacksonville to an elite New York nightclub, from the rural South to the white suburbs of the Northeast. This is a powerful, unsentimental examination of race in America, a hymn to the anguish of forging an identity in a nation obsessed with color. And, as Arna Bontemps pointed out decades ago, "the problems of the artist [as presented here] seem as contemporary as if the book had been written this year." This is a really hard review for me to write there is just so much to say about the book and I have no idea where to start. And if I said all that I wanted to say, this review would end up a term paper instead of a simple review. 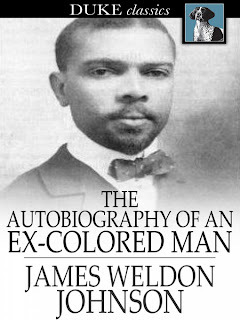 Simply stated The Autobiography of An Ex-Colored is about a mulatto man that can pass as white. But the story is much deeper and more complex then just skin colored. Set in the early 1900's Weldon touch on a lot of issues dealing with racial prejudice and cultural identity. It's very interesting to watch the the narrator try to reconcile his racial background (black) with his appearance and upbringing. At one point in the story a "friend" of the narrator makes a comment that narrator was raised as a white man and should live his life as such, that it would be much easier for him to do so. There is a since that the narrator never really fits in anywhere, partially because of the ambiguity of his appearance and also because he really has no family or close ties. He ends up drifting through life with nothing to hold him down to one place or tie him to one group (race, family, friends, etc). Something that I find interesting about The Autobiography of an Ex-Colored Man is that the issues presented in the book are still relevant today probably even more so, given the fact that the U.S. has a black (mixed) president. It is amazing how after 113 years very little has really changed in the regards to race and culture in the US. 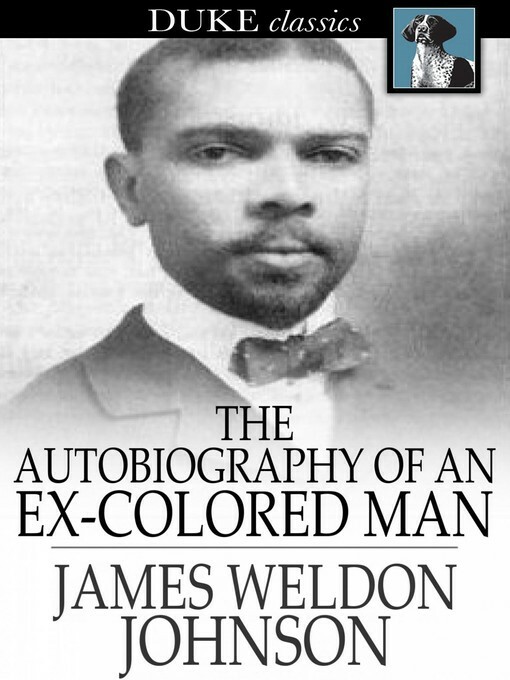 The Autobiography of an Ex-Colored Man is not a "light" read when it comes to subject matter. But Weldon was able to pull me in and make me want to flip to the next page. I was surprised by how expertly he dealt with each topic and situation in such a sort book. I think part of the reason is because that it is done in memoir form so the reader gets the feeling that they are listening to an old man reflecting on his journey through life and questioning some of the decisions that he made. Honestly, when I finished reading this book I wasn't mad at all over his decisions...I thought I would be, but I wasn't. Very good book. And I completely agree that writing a 'review' for this is pretty much impossible. I wasn't mad about his decision either. I was more sad that he felt that in the end he got the short end of the stick. With all the awful things happening in this book, the end was the one time that I felt like crying. This book has been on my TBR for some time. I never knew it was fiction.I'll have to bump it up on the priority list now. This makes me want to read it even more. I'll have to include it in my next Amazon haul. I thought it was an autobiography too. It is written like a memoir but it is very engaging without being preachy. I'm pretty sure I read this one. Now, I have to check and see if it was this book. Great review! This sounds like an interesting read, and i would be curious to read this mans perspective. Wonderful review and yes this book would totally make a perfect term paper topic in so many subjects! Monique has read 0 books toward her goal of 50 books. Bella is reading . . . This blog is a personal blog written and edited by me. For questions about this blog, please contact thelittlereadingnook@gmail.com. This blog does not accept any form of cash advertising, sponsorship, or paid topic insertions. However, we will and do accept and keep free products (books). The owner(s) of this blog is not compensated to provide opinion on products, services, websites and various other topics. The views and opinions expressed on this blog are purely the blog owners.